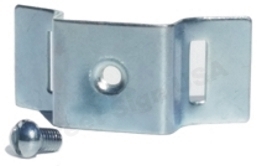 Additional bracket for use when attaching 2 signs back to back around a post or pole. Purchase them along with our Adjustable Band Brackets Assembly Kit. Sold by the piece, 5/16" x 1/2" slotted pan head screw included. 2 band brackets would be required if you're planning to mount 2 signs back to back using the HW-AB-10 Adjustable Band Brackets assembly kit.